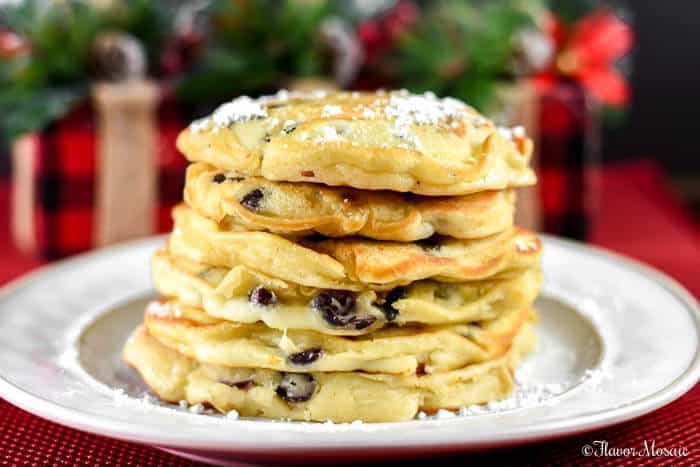 Cranberry White Chocolate Chip Pancakes dress up traditional pancakes with dried cranberries and white chocolate chips and make a delicious weekend or holiday breakfast or brunch. Click here to receive FREE recipes in your inbox! Love this recipe? Receive FREE recipes in your inbox! When I was a kid on holidays or long weekends my Dad would make us a batch of Pancakes. It was always a treat for us kids when my Dad would cook because he enjoyed cooking and always made everything taste so good. Certain recipes hold many memories because of the people we shared them with. We did not have pancakes often. But when we did, it was when the family was all together, usually on a holiday weekend. 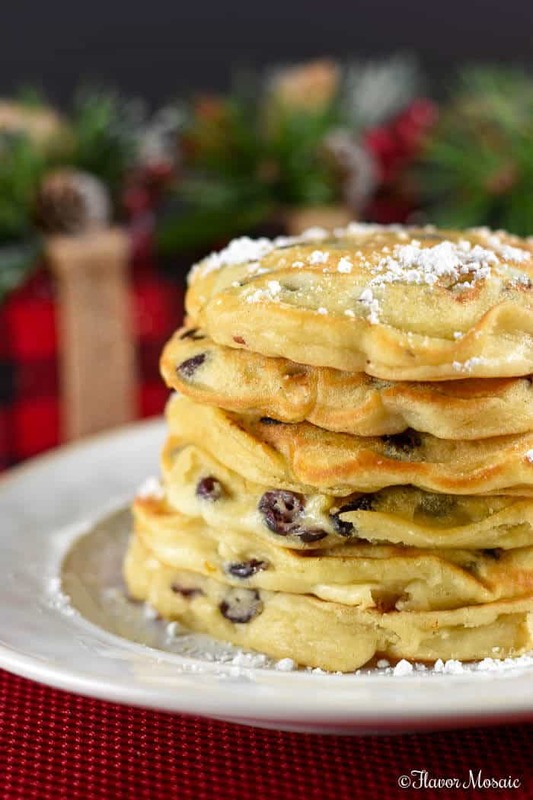 I would love to say that as a kid we had these Cranberry White Chocolate Chip Pancakes. However, my Dad did make classic pancakes that were moist and fluffy and delicious. 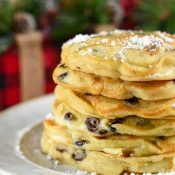 I start with a classic fluffy pancake recipe and dress it up for the holidays with dried cranberries and white chocolate chips. Cranberries and white chocolate chips scream Christmas to me. There is something about those flavors that marries well together. I’ve had cranberry pancakes before and pancakes with white chocolate chips. But this is the first time I thought to combine the two together, and I’m so glad I did. 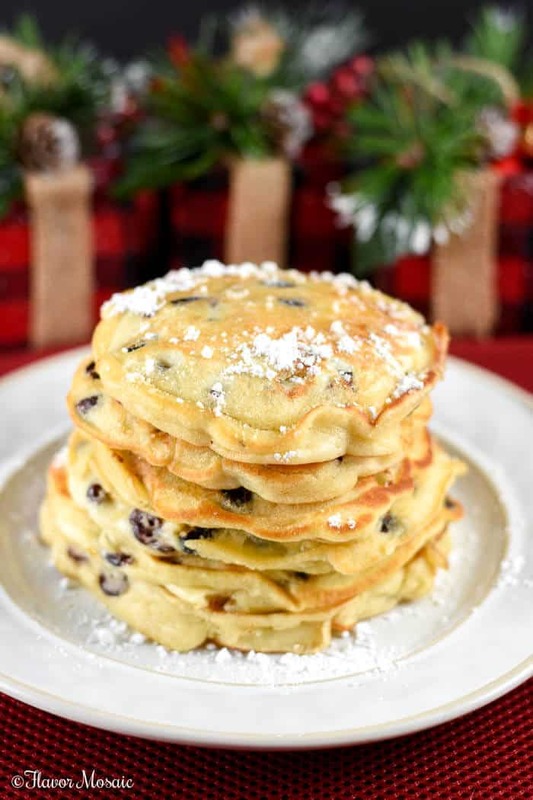 The cranberries and white chocolate chips certainly make for pretty pancakes. I like to serve them with powdered sugar on top. The key to success for these pancakes is not the cranberries or white chocolate chips. The key to these pancakes and any pancake recipe is in the base pancake recipe and the cooking techniques. If you start with a good base recipe like this one then you are on your way to success. I like to use buttermilk in pancakes. If you don’t have buttermilk you can add 2 tablespoons of vinegar to 3/4 cup milk and let it sit for 5 minutes to create a “sour milk” to use in place of buttermilk. Why do we want to use buttermilk? Because when the acid in buttermilk combines with baking soda, it makes the pancakes rise more to make the pancakes fluffier. Another key to success is making sure your griddle or skillet is hot (but not too hot) when you first drop the batter into the skillet. I recommend heating the skillet when you first start preparing the batter so the griddle or skillet is nice and hot when you begin. If you follow these two keys to success you will be rewarded with the best, fluffy Cranberry White Chocolate Chip Pancakes you can make! 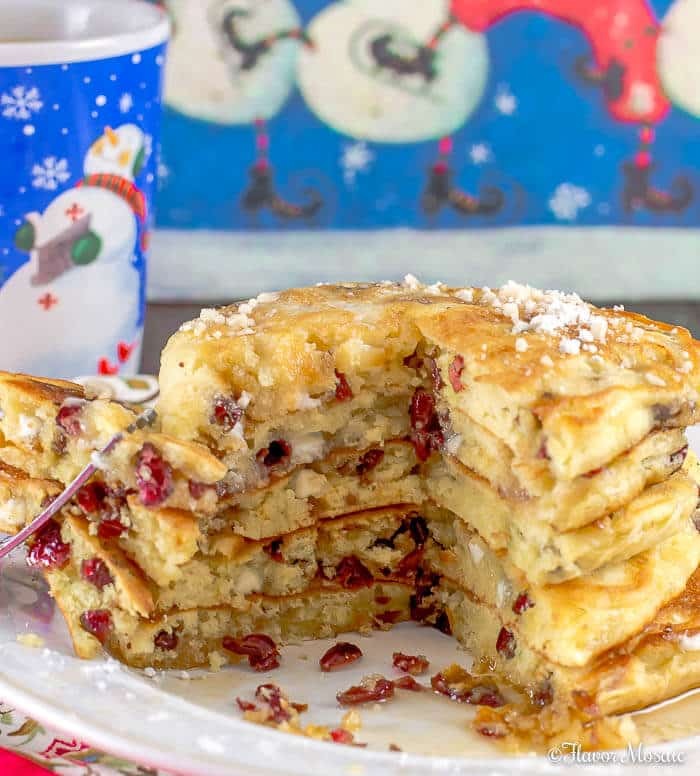 For which occasion will you bake these amazingly delicious Cranberry White Chocolate Chip Pancakes? 1/2 cup white chocolate chips. Heat a large skillet over medium heat, and coat with cooking spray. Combine milk with vinegar in a medium bowl and set aside for 5 minutes to "sour". Combine flour, sugar, baking powder, baking soda, and salt in a large mixing bowl. Whisk egg and butter into "soured" milk. Pour the flour mixture into the wet ingredients and whisk until lumps are gone. Pour 1/4 cupfuls of batter onto the skillet, and cook until bubbles appear on the surface. Flip with a spatula, and cook until browned on the other side. Repeat until all pancakes are cooked. Serve with butter, powdered sugar, and syrup.